Much scientific study is currently being done re reducing prostate enlargement, by ingesting Watermelon Seed Oil. In fact, it is recommended that if you would like to derive any of the above health benefits, you should ingest one teaspoon in the morning, and one teaspoon at night. Or simply pour the oil, unheated, over your meals. Watermelon seeds, contain citrulline, a non-essential amino acid that converts into the amino acid L-arginine when eaten. Citrulline acts as an antioxidant, as well as a vasodilator, according to the USDA. Laboratory experiments on animals, proved that Watermelon Seed Oil (Citrullus lanatus) was able to reduce the size of the prostate, in only a few weeks. 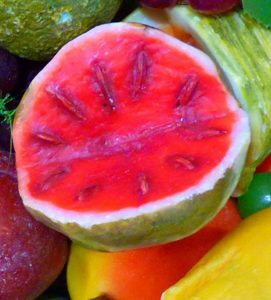 The experiments used MECLS (Methyl Extract) of Watermelon Seed Oil, but a far purer version is the Cold Pressed Watermelon Seed Oil, which contains none of the toxic methyl. 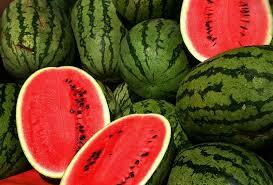 Watermelon Seeds are one of the richest sources of citrulline. Citrulline is a nonessential amino acid and antioxidant, that is converted to another amino acid called arginine. Citrulline’s ability to increase L-arginine supplies in the body, might offer benefits in treating high blood pressure, sickle-cell anemia and elevated glucose levels, according to the United States Department of Agriculture. Arginine has a key role in cell division, wound healing, and the removal of ammonia from the body. Arginine detoxifies, by removing ammonia and other toxins from the body. It also boosts nitric oxide, which improves blood flow and post workout recovery. Citrulline is an amino acid that is commonly converted by our kidneys and other organ systems into arginine (an amino acid). The only way to benefit from this amazing discovery, is to ingest Watermelon Seed Oil, because, otherwise, you would have to ingest thousands of watermelon seeds, to derive the same benefit. 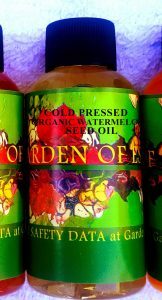 The Watermelon Seed Oil must also be UNREFINED, which ensures that all the active nutrients are present. Lastly, the Watermelon Oil must be Organic, as pesticides degrade the potency of the seeds. After reading the research papers, I was so impressed that I searched for days, and finally found a supplier of Organic, Cold Pressed, Unrefined, Watermelon Seed Oil. Furthermore, I choose the Cold Pressed Watermelon Seed Oil over the Methanol-extracted Watermelon Seed Oil, as it is chemical free, and yields far purer compounds. Scientific studies on watermelon extract. A variety of peer reviewed studies on watermelon extract and prostate size.